This is our collection of magazine basepads. Included here are offerings from Dawson Precision, Arredondo, and Taccom for 2011, Glock, S&W M&P, and Springfield XD pistol magazines, AR15/M16/M4 and AR10 rifles. 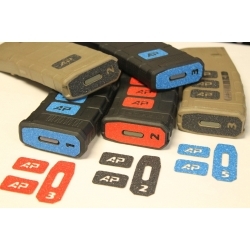 Available in a variety of colors in some cases, which allows the shooter to personalize gear or color code specific types of magazines to make identification easier.